saw some pics of Legion Field and the 2 lowest sections on each side of the field have been tarped off as have the upper 2 sections on the visitor side. Looks like there will be no seating on the south end zone side and only limited seating on the north end zone. These changes will consolidate seating and give us a much "fuller" look for crowds. 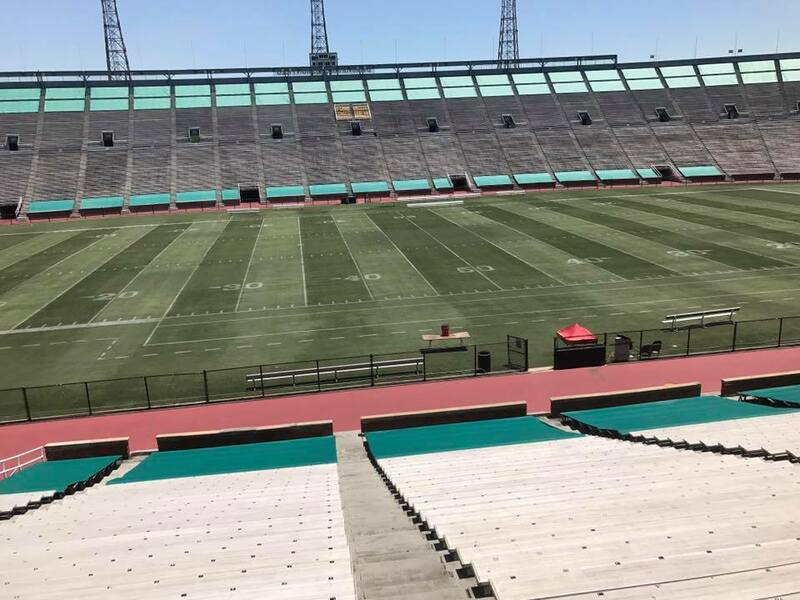 (07-11-2017 05:16 AM)CourtsideBlazer Wrote: saw some pics of Legion Field and the 2 lowest sections on each side of the field have been tarped off as have the upper 2 sections on the visitor side. Looks like there will be no seating on the south end zone side and only limited seating on the north end zone. (07-11-2017 05:16 AM)CourtsideBlazer Wrote: the 2 lowest sections on each side of the field have been tarped off as have the upper 2 sections on the visitor side. This doesn't make any sense. There is only two sections all the way around the stadium- upper and lower, divided by the walkway that goes all the way around. The north and south end zone seats are the newest parts of Legion Field seating. An earlier photo of the old south end (with Gate 7) was shown earlier in this thread. The North end zone seating is the newest and was built so that its front supports did not conflict with the track (as in Track & Field) which was when Legion Field was still hosting those competitions. The track is still there, but has not been maintained for years. As I recall, before the north end zone seats were built, Legion Field was a "horseshoe" stadium, enclosed only on the south end by low level (the same height as the original east and west stands) seating. It's just the lower rows where you cannot see over anyone's head on the sideline anyway and on the visitors side when he says sections he doesn't mead the entire upper level, just several rows. what he said..."sections" was probably a poor choice of words. Cant see em? Did you post? At Legion Field the "sections" run from Row 1 (at track level) to Row 60 on the east and west sides with the walkway at about Row 30 halfway up. Sections 10 & 11 are the 50 yard line seats on the west side with two sections being the corresponding ones on the east side. According to the circulated letter from the Park Board, there is a total of 26,000 seats in the east and west stands combined between the goal lines. When the seats behind the goal lines and beyond the end zones are added, you have the balance of the 70,000 seats Legion Field boasts it has. I thought I may have been the only one. I can't see any posted pictures or anyone's images in their signatures. Is CSNbbs having issues? did they have to move any season ticket holders? My only concerm is that it pushes the crowd even further away from the field which, with the red former track, is already a good distance away. It lessens the crowd noise that is a large part of home filed advantage.